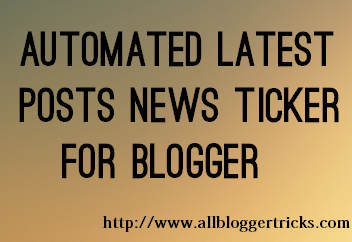 Today I will show how you can add Automated Latest Posts News Ticker to your blogger blog. WordPress blogs can add these things easily by uploading the plugins but in blogger we have to manually add code for it. So this widget will show the 10 [can be increased or decreased] latest posts of your blog in a ticker box. This ticker is fully automated and you just have to add URL of your blog and it will update the new posts automatically. The live demo of this widget can be seen by clicking the below Live demo button. This ticker will be below the two navigation bars. Once you have seen the demo we can move on with the instructions of how you can add this news ticker to your blogger blog. First go to Blog Title → Template → Edit HTML. Press Ctrl + F and search for <div id='content-wrapper'> and add the given code just above it. var scrolling_speed - Increase/Decrease the number to increase/decrease scrolling speed. var info_text - If you want to remove/keep the text "Latest Articles" and RSS icon. After making the changes save the template. You are done now. Now you and your visitors can see this Automated Latest Posts News Ticker in your blogger blog. Help me in placing this widget please. I can't find this div id='content-wrapper' in the html. Could it be something else I need to search for? I think the reason why it doesn't work on my blog is because I have altered the lay-out and added some widgets before this. On another blog of mine which is quite empty and has a simple lay-out it worked right away. Btw I had to look for descriptionwrapper and not content-wrapper. I can't use this widget but maybe this might help others. This is exactly what I've been looking for. Couple things. It needs a "Stop on Hover" effect. Also, is it possible to change the background and font, blond etc on the words. Also change the Latest Articles to whatever we want? Is there away to get it to show on every page? i tried in my blog. Very nice, and will to try at my other blogs and share this. it is so nice bro thanks alot for this ..
nice widget thnks for help. Please i did just you described in your article but it is not working for me any help? Hey I Not Find Code in My Blogger Url. Very well study and well presented. And thank you for all. Thanks for share with us.we can get all news from this blog. if need all news in hand just need to download this online news app in your smartphone . i tried it on my blog. But How I can change background and titles posts colors? Thanks for notifying we have updated the code now. there was a issue with the script so we have added the new one. Now you can add it and use in your blog. If you have any questions further then don't hesitate to ask. Don't worry @Johnpaul We have added another way to add the widget to your blog. Thanks or notifying this problem to us. I think you have different template coding so you can't find the div element. Hello, It is working correctly. I have checked just now. Could u make one for popular posts? Yes, I have noted down your request it will be processed within few days. Thanks for the compliment. What kind of help you need? I would love to help you.